The recent National Alliance for Grieving Children conference brought together Dr. Heidi Horsley and Diana Wright of TAPS Youth Programs. She’s been a volunteer for five years, and came on staff as a programs coordinator. She first learned about TAPS in 2007, and learned how incredible the Tragedy Assistance Program for Survivors is for bereaved military members and their families. She started volunteering and found a path of healing after her son died in the military. 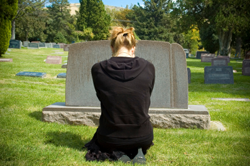 It took six months after his death before she started actively looking for grief support. Both of Wright’s children have died, and this has given her the opportunity to be a part of other’s grief journey and to connect with children. For Wright, it’s all about the connections. Connecting with kids, other parents, and peers is critical. Everyone identifies hope in their own way, so she can’t say what will work for anyone else. However, for her, reaching out and connecting was the key. You might need to be the proactive one, since many people find the support system they thought they would have disappears after a tragic loss. Your best support group might not always look like you imagine. It can be made up of people who you’ve never met before. It might be in an intimate group setting, at a grief camp, or through TAPS. Keep searching until you find the right match, and Wright says you’ll know it when you see it. She instantly felt heard and welcomed at TAPS, and it became her go-to support network. TAPS offers a variety of programs geared towards military families. It’s a unique type of loss that few others experience. Although when someone serves in the military there’s always the idea that death can occur, nobody really believes it unless they experience it.